Celebrity Jersey Cards is a regular series in which I create virtual trading cards for jersey-clad celebrities. Today, we continue working our way alphabetically through Major League Baseball. Body builder Lou Ferrigno was born in Brooklyn, NY. He rose to fame in fitness competitions, then turned to acting. Famous for Hercules and The Incredible Hulk, Ferrigno also had a comedic role on tv's King of Queens. 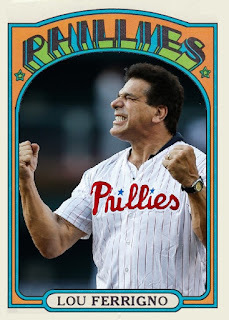 I wish Ferrigno would have worn the older powder blue Phillies jersey for his Celebrity Jersey Card. Born in Montreal, Canada, Bernie Parent rose to stardom as a goalie for the Philadelphia Flyers. He also had stints with the Boston Bruins, the Toronto Maple Leafs and the Philadelphia Blazers of the WHA on his way to a Hall of Fame career. It is only fitting that Parent is wearing a Phillies jersey on his Celebrity Jersey Card.